Disclosure: This is not a sponsored post. We were sent a copy of The Lion king to facilitate this post. My emotions go all over the place when it comes The Lion King, it's one of my most treasured Disney movies and I've made sure to share it with both my kids. We've been counting down the days until this special Signature Collection of The Lion King came out. Valentina's face says it all, she was ready to celebrate the circle of life and couldn't wait to watch The Lion king, even though she's watched it dozens of times. Nothing like dancing around to "I Can't Wait To Be King" and "Hakuna Matata". The Lion King is definitely one of those classic movies that goes down from generation to generation. I still remember watching it in the Movie Theater with my parents when it came out, and then getting to watch it with my kids. Every single time I end up crying, even though I know what's going to happen it always gets me. Our copies came with an original movie strip from The Lion King, perfect for passing down to our kids and their kids. A classic movie that will never be forgotten, now is the time to get your hands on a copy for you and your family. 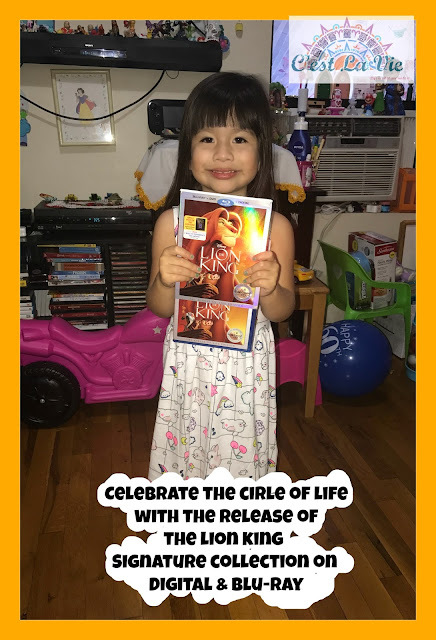 Some stores are already sold out but don't worry because I will be giving away one Blu-Ray copy and one digital copy of The Lion King, to 2 C'est La Vie Readers. 9 comments on "Celebrate The Circle Of Life With The Release Of The Lion King Signature Collection"
Love the Lion King!!! My favorite song is Can you feel the love tonight? Oh the lion king is my favorite Disney movie!! I made my parents watch it with me practically every night when I was little! My favorite song is I Just Can't Wait To Be King! Hakuna Matata because it always puts me in the best mood! The Circle of Life, of course! No movie has a better intro song. The circle of life is my favorite!